2016 Mens Curling at the Amherst Curling Club has been playing the President vs Vice Presidents Trophy for 3 rounds of the Double Round Robin event. The Paul Hawkes team with 3 wins lead the pack, followed by the Ray Fowler foursome then Peter Rushton’s team. Last place is currently held by Lester Wah’s team with 3 losses. Play continues next Monday evening. 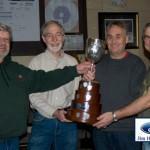 Drop in and watch some local Curling, 7:00 PM at 45 Prince Arthur St., Amherst. The Public is welcome to drop by.